Out on one of the private points which just into Lake George in the Adirondack Mountains, Rhobie and Tom stood. Surrounded by the lake and backed by the mountains, the sun had just set. The warm glow had faded. That was fine with me. So many sunset wedding photos, after all … I watched as the purple of evening began to spread across the sky. I dropped a tiny bit of light onto the two of them, just to accent them and pull them from the background a little. Then, in a few minutes we were done. They stood lovingly together. The magic of an Adirondack wedding twilight was there, a gift given to me from the photography gods. With the longer days of summer, there is ample opportunity for taking late day and early evening portraits with a couple. Time can be set aside to make quiet and intimate twilight images by the lake or to move more into mountain and forest locations as twilight during a summer wedding can last for quit a lot longer than it does at a spring or fall wedding. Sunset at a summer wedding seems to happen much more slowly. Spring and fall weddings can have beautiful sunsets, but they happen much faster and at times there aren't the clouds in the cooler times of the year, clouds which produce spectacular colors making for great wedding photos. Planning your Lake George Wedding is easy with all of the resources available on the web. But for true wedding photojournalism you want Mitch Wojnarowicz a real wedding photojournalist in the Adirondack Mountains. Leave time on your wedding day for just the two of you to spend time with your wedding photographer. 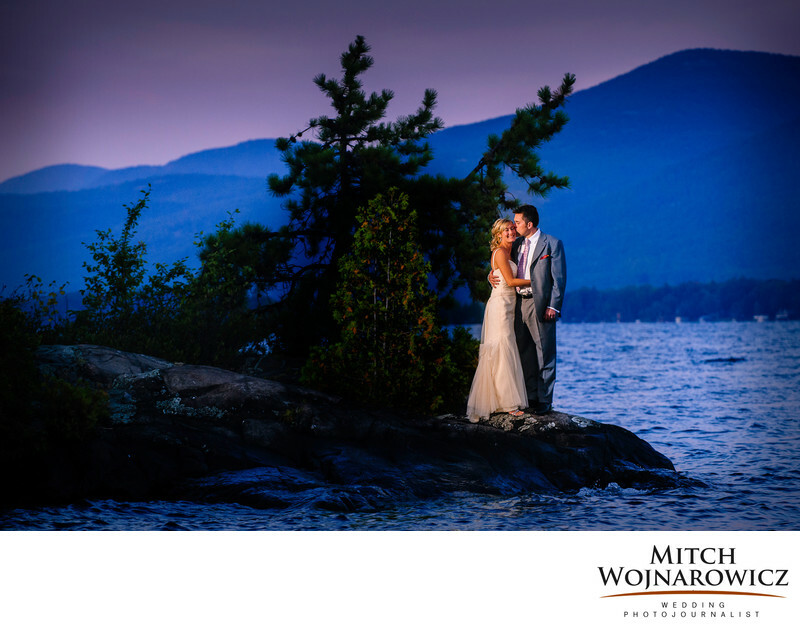 Want To Speak About Your Wedding on Lake George NY? Some guidance and some things you can think about. An experienced photographer dedicated to listening to what your ideas are and what you’re looking for in your wedding photographer. No sales techniques. No pressure. Just a photographer with deep experience and a desire to share what he knows with people who are completely inexperienced at planning a wedding. That’s what you’ll get from me. It would be great to see if we are a good match for each other. Keywords: adirondack (60), lake george (30).